After five years of fair-weather bike commuting, my local bicyclist association finally has my membership. 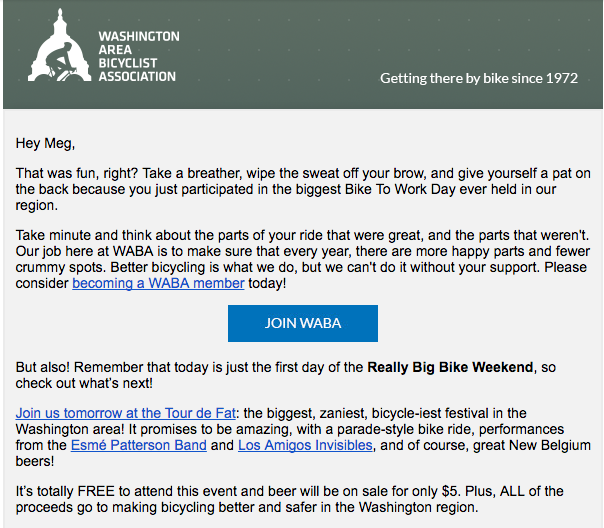 They can chalk it up to a perfectly-timed email that hit my inbox a mere 60 mins after arriving at my office on Bike to Work Day (BTWD, as the cool kids say). Timing was everything in this case. I had just enjoyed an 11-mile ride through the city, past the national monuments, over the Potomac and down the historic Mt. Vernon trail. Not to mention it was a beautiful, sunny spring morning after weeks of non-stop rain. Needless to say, I was in a giving mood. First thing the email did was offer a big pat on the back for my BTWD success. Praise: check. It then goes on to tell me about their zany upcoming events -- even ones with beer. "Yes yes, I want more fun. You’ve convinced me." Easiest place to direct my support? That big blue “join” button in the middle of the page. Big thumbs up to my bike association for harnessing the energy of this huge annual event. It got me thinking about the way thoughtfully-crafted, day-of communication can really extend the value of an event. Engage people during that small window while you are still on their minds. That’s the power of remarketing.